Jesus' resurrection is the catalyst for the mission of the church, beginning with the disciples and throughout history. Indeed, the growth and spread of the church, is a proof of the historical fact of Jesus' physical resurrection or rising from the dead. Having been raised from the dead, Jesus' mission to earth is coming to an end and shortly He will be returning to the right hand of the Father. Before He does so though, He has some more words to say to His disciples. Lets read Acts 1v1-12 for what happened between His resurrection and ascension. The first book I wrote, Theophilus, concerned all that Jesus began both to do and to teach, until the day in which he was received up, after he had given commandment through the Holy Spirit to the apostles whom he had chosen. To these he also showed himself alive after he suffered, by many proofs, appearing to them over a period of forty days, and speaking about God's Kingdom. Being assembled together with them, he commanded them, "Don't depart from Jerusalem, but wait for the promise of the Father, which you heard from me. For John indeed baptized in water, but you will be baptized in the Holy Spirit not many days from now." Therefore when they had come together, they asked him, "Lord, are you now restoring the kingdom to Israel?" He said to them, "It isn't for you to know times or seasons which the Father has set within his own authority. But you will receive power when the Holy Spirit has come upon you. You will be witnesses to me in Jerusalem, in all Judea and Samaria, and to the uttermost parts of the earth." When he had said these things, as they were looking, he was taken up, and a cloud received him out of their sight. While they were looking steadfastly into the sky as he went, behold, two men stood by them in white clothing, who also said, "You men of Galilee, why do you stand looking into the sky? This Jesus, who was received up from you into the sky will come back in the same way as you saw him going into the sky." Throughout the Gospel of Matthew, Jesus' authority is a major theme. Where Matthew records Jesus doing miracles, this is to highlight Jesus authority in action and not just merely in words. Matthew records Jesus' authority to forgive sins (Matthew 9v6) and He imparted authority to His disciples for a short time when they went on a mission in Matthew 10. Jesus has authority (Matthew 28v18) over all things, all people, all circumstances and happenings. Jesus has authority over all spiritual beings, whether angels or demons. Jesus has authority over all nations, governments and rulers. Jesus has authority over all earthly and spiritual authorities. Jesus has the authority. This means regardless of what ever the Christian Disciple faces, Jesus is in control. Therefore, as Christian Disciples, we can obey him without fear of retribution from those who would seek to harm us. We can obey Him regardless of the circumstances we find ourselves in. It is a great comfort to know, that He is in control of everything!! Through His death on the cross and His rising from the dead, Jesus has conquered all enemies. Now people sometimes confuse authority with authoritarian. Authoritarian means severe, rigidity and a dictator. None of these apply to Jesus. We have been given a free will, but as His disciples, we should choose to exercise our free will to obey Him and live a life worthy of Him. As the Christian depends on Jesus' authority, the Christian Disciple gains wisdom, guidance, and power. If Jesus had not risen from the dead, then the disciples would not have had a story to tell. But Jesus had indeed risen from the dead, and the early church exploded numerically as the twelve disciples exercised Jesus' authority and His power. 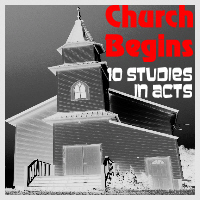 We read about the growth of the early church in the Book of Acts. Christianity is a faith whereby all Christian Disciples are to tell others of the goodness of God. Indeed God Himself is a missionary God. Ever since Genesis 3 and the fall of man, God has been on a mission to bring and call people back to Himself. That was the purpose of the nation of Israel, to be a light to all nations of the goodness and glory of God! That was purpose when God, who is outside of time and space, entered human history taking on human flesh and restricted Himself in a human body as the man we know as Jesus Christ. Jesus whole mission was one of calling people back to life in God. As followers of Jesus Christ, all Christian Disciples are to evangelize. Evangelism is showing and telling others of God's message of reconciliation to all people of all time. It is not forcing people to adopt Church standards (1 Corinthians 5v12) and nor is it simply a message of join the church as a symbol of good works (Ephesians 2vv8-10). As I said before, we are all to do the work of an evangelist (2 Timothy 4v5). In these last words of Matthew's Gospel, all Christian Disciples are to make disciples throughout the whole earth! Making disciples is not just evangelism but ensuring that guidance and care is given to new Christian disciples. How is this achieved? How can the Christian Disciple exhibit Jesus' authority and power in evangelism? Who gives the impetus for Christian Disciples? That is part of the role of the Holy Spirit, whom Jesus said would come once He had ascended back to the right hand of God the Father. Mark 16:14-19, Luke 24:50-51 and Acts 1v1-12, we read about Jesus physically ascending into the heavens. He is returning, as He said he would do, to the right hand of the Father. During their last discussion with Jesus, the disciples were still expecting him to lead a revolution against the Romans (Acts 1v6). Despite all Jesus had said to them in the previous 3 years, they still did not understand that Jesus had come to lead a spiritual kingdom and not a political kingdom. Hence He tells them to go back to Jerusalem, with for the Holy Spirit and then go tell others the Good News about Him! And even after Jesus had vanished into the clouds, the disciples still gathered around looking into the sky for Him to return! So two angels came and said "You men of Galilee, why do you stand looking into the sky? This Jesus, who was received up from you into the sky will come back in the same way as you saw him going into the sky." (Acts 1v11) From there the disciples returned to Jerusalem and waited. They didn't have to wait long, 10 days, until the Holy Spirit came, filled them and started living with them. This is in fulfilment of Ezekiel 36v27 "And I will put my Spirit in you and move you to follow my decrees and be careful to keep my laws." where Almighty and All-powerful God will indwell those who follow Him. Throughout His ministry Jesus had talked about how after He was to depart, and that the Holy Spirit would come (John 15v26). The Holy Spirit is also a Person and is always referred to as ‘He' in the New Testament (John 16v14). He relates to us as a person for He is comforter, guide and teacher (John 14). He can be blasphemed against and be grieved (Ephesians 4v30), and wherever the Holy Spirit is, the Father and Son are also present because they are one. (John 14v18-23). Throughout the Book of Acts and in the other New Testament writings we discover more about the Holy Spirit. We see that His prime role to to glorify Jesus Christ the Son of God is praised and glorified (John 16v13-14). He will testify for Jesus Christ (John 15v26). He will witness for Jesus Christ (Acts 1v8). The Holy Spirit is involved with ministering to members of the church, as Jesus would be to us if He were here. The Holy Spirit declares God's Word, interpreting and illuminating it. He convicts of sin, transforms, indwells, fills, baptizes and seals the believer. With all this, the Holy Spirit also equips for service. God is at work in His body the church, to will and to act accordingly to his purpose (Phil. 2v13), to be my witnesses (Acts 1v8). This is evident in the book of Acts and the other New Testament writings. How is the Spirit seen? The Spirit's work is in evidence, where people's lives become more holy and more like Jesus Christ (1 Corinthians 12v3; 2 Corinthians 13v7). Sometimes the Holy Spirit works also in powerful ways, with miracles. But He also equips Christian Disciples for service, through the giving of spiritual gifts. Not just the so called more spectacular gifts of healing, miracles etc but also gifts such as mercy, generosity, helps and service.